Incoming WSSS students join an interdisciplinary cohort of students from across Tufts' graduate schools. 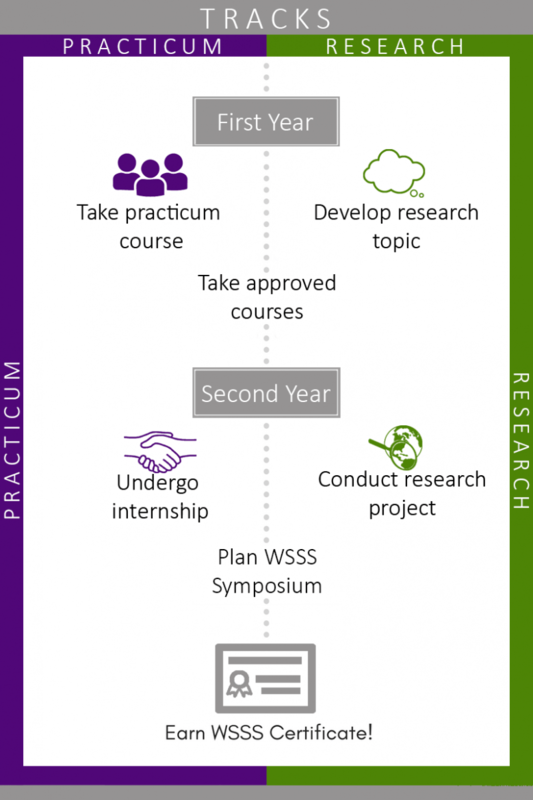 All students take courses containing water content and participate in joint activities, such as planning the annual WSSS symposium. Additionally, students customize their certificate by choosing to pursue one of two tracks: practicum track or research track. *Please note: the WSSS curriculum aligns best with graduate students completing a two-year, degree program; however, students completing a one-year program may be accommodated on an individual basis. Courses: Take two courses from the approved courses list and take one practicum course. Practicum course: The practicum course comprises of a small student group that works with real-world clients to address water-related problems. The practicum course is completed in the student's first spring semester. WSSS Symposium: Organize the annual WSSS symposium with peers. Students participate in the symposium in their last spring semester. Internship: Gain professional experience by completing an internship with an organization working within a water-related field. Students may refer to the list of internship organizations that partnered with students in the past. Courses: Take three courses from the approved courses list. WSSS Symposium: Organize the annual WSSS symposium with peers. Students participate in the symposium in their second spring semester. Research Project: Complete a water-related research project. The research topic may align with research that the student is conducting for completion of a thesis, capstone, directed study, dissertation, or other research requirement of his or her degree, but there are additional requirements of the WSSS research project which are outlined below. The project topic must also be pre-approved in the student's first spring semester. Publication: Students write a publication-ready journal article or manuscript. Although it is not required, we highly encourage our students to submit their work to a peer-reviewed journal. Presentation: Students present the research publicly, in an oral or poster presentation, at a local, national or international conference.